Tulsi is a sacred plant in southern part of India. 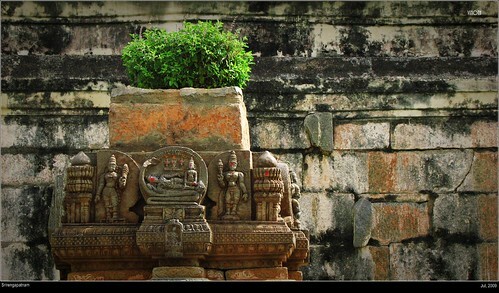 Most houses will have a tulsi madam ( A kind of cement pillar in which tulsi is planted ). Usually women used to keep kumkum on the plant and pray daily morning after taking bath.During evenings they will light lamp near tulsi and pray. In temples they give tulsi water as a prasadam. The housewife has a daily routine of performing Puja of this plant. She pours holy water from the puja into the soil supporting the plant, joins her hands in obeisance, and prays for prosperity, and happiness of the family. Tulsi is worshipped again in the evening, with a small lamp lighted before it.During monsoon daily worship of Tulsi becomes an indispensable religious ritual. Hindu scriptures look upon Tulsi as the divine representative of the Lord Vishnu on earth. Sri or Lakshmi tulsi should be kept in front of the house. Sri or Lakshmi tulsi should be kept in East (Purva) Direction. Guruji has given the reason behind it, Pregnant women can go to Temple, but should not have the theeram (tulsi water) given in the Temple, because pacha karpura (crystals of champhour) is mixed in it along with tulsi, which is not good for pregnant women. It becomes slow poison. To avoid it, they say “ Pregnant Women should not go to Temple “. Pregnant women can have the Fresh Raw Tulsi, which is good for health. During Menstrual Cycle, Women should not go near tulsi. Women should not pluck tulsi from the plant, only Men or Boy can pluck tulsi from the plant. Men should not use their Nail to pluck the tulsi, use your fingers only. Offer Prayer to Tulsi by Reading Lakshmi Narayana Hridayam. If this is not possible, Guruji has asked to read Lakshmi Astrotram and Narayana Astrotram. Take a Silver Chombu, or Tamara Chombu ( Don’t use Steel Chombu ), fill it with water, add tulsi leaves, Vilva leaves, Jasmine Flower. Keep it in the Pooja room at Night. Early morning (5:15 AM to 6:30 AM), ask the Male Head of the Family to take the Chombu to Tulsi Madam. Apply arishina ,kukuma to the pot or madam ( Dont apply to plant) pour half of the water in the chombu to tulsi madam ( A kind of cement pillar in which tulsi is planted ) or pot. Take the poured water in the pot and sprinkle it on your head and pray to Surya Bhagwan. The remaing half water should be kept in the pooja room itself. In the evening, Wife of the Male Head should take the remaining half water to the tulsi madam. She should put rangoli, apply arishina, Kumkuma to Tulsi Madam and light the lamp with Ghee. Put the rangoli using arishina & Kumkuma i.e. just put two lines each. If you light the lamp with ghee, you should make some sankalpa like sankalpa for good education of children, Good health etc.. I am not sure in this point, whether to Pour the remaining water to the Pot or not. And to continue to keep the silver chombu filled with above said items the next night. Offer your prayer to Tulsi. Sorry, I don't know answer for this question, pls ask any Archak or priest in temple or elders in your home. According to Sri Narendra Babu Sharma, Woman are Nithya Sumalgali from there birth to death. It's really great post and nice information about the tulsi in your website. and Anybody get right information by your website and your post.tulsi have a 1000 of benefits.Holy Basil / Tulsi (Ocimum sanctum) is a very important herb in the Ayurvedic system. means "the incomparable one." In Ayurveda, it is in the Rasayana "tonic" category of herbs, supporting good health and normal function of the whole body. 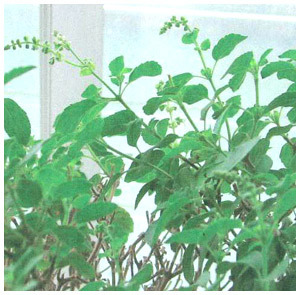 If you want to more information about theTulsi Extract Capsules / just click hear. In Evening time - Don't Pour water / Don't Speinkle water on Tulsi Plant .